Ireland, 1848-1865. James Joseph Kenny was born in Ireland in 1848. He had an older sister Ellen who was born there in 1844. In 1863, when James was 15, a sister Catherine was born. Chicago, Near South Side, 1865-68. In 1865, James, 17, and his older sister Ellen, 21, immigrated to Chicago, Illinois. In 1865, there were 36 states in the Union, the latest being Nevada. Andrew Johnson was President of the United States. Assuming James was living in the same area as he was living in the 1870 census, James was living in the 3rd Ward of Chicago, which was on the Near South Side between Harrison and 12th Street (now Roosevelt Road) and between the Chicago River and Lake Michigan. James worked as a teamster. Chicago, Near South Side, 1867-1868. In 1867, at age 31, Mary Hartigan immigrated to Chicago, Illinois. In 1867, there were 37 states in the Union, the latest being Nebraska. Andrew Johnson was President of the United States. Assuming Mary was living in the same area as she was living in the 1870 census, Mary was living in the 3rd Ward of Chicago, which was on the Near South Side between Harrison and 12th Street (now Roosevelt Road) and between the Chicago River and Lake Michigan. 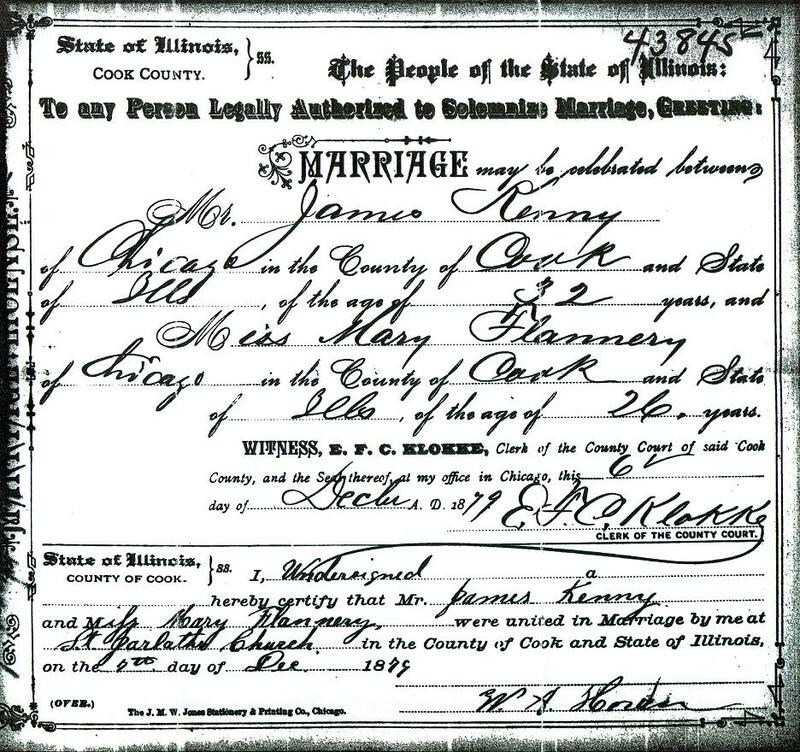 James Kenny, 20, and Mary Hartigan, 32, were married in Chicago in 1868. Chicago, Near South Side, 1868-1870/71. James and Mary's first son John T. Kenny was born in Chicago in 1868. In 1868, James' older sister Ellen married Hugh McNally, a watchman. In the 1870 census, Ellen and Hugh lived in the 9th Ward of Chicago, which is on the Near West Side between Van Buren and 12th Street (now Roosevelt Road) and between Loomis Street and the Chicago River. In the 1870 census, James and Mary were living in the 3rd Ward of Chicago, which was on the Near South Side between Harrison and 12th Street (now Roosevelt Road) and between the Chicago River and Lake Michigan. Albany, 1870/71-1871/79. James and Mary's second son, James M. Kenny, was born in Albany, New York, on January 3, 1871. Why James M. was born in Albany rather than Chicago is unknown. His family lived in Chicago before and after his birth. 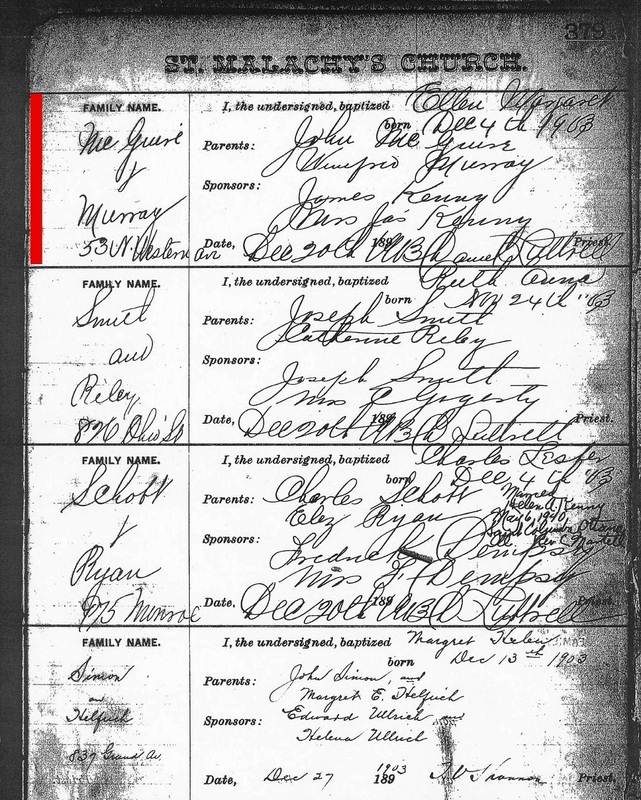 In the 1870 census, his family was living on the near south side in Chicago. In 1879, his mother died in Chicago. So, his family moved to Albany in 1870 or 1871 and back to Chicago sometime between 1871 and 1879. The Chicago Fire was October 9 and 10 of 1871, nine months after James M. was born. Chicago, Near West Side, 1871/79-1879. Sometime between 1871 and 1879, James and Mary moved to the Near West Side in Chicago. They lived at 1079 W. Lake Street (2511 W. Lake Street after 1909). This was in St. Jarlath Parish. St. Jarlath was an Irish parish located at 1713 W. Jackson Boulevard (after 1909). It opened in 1869 and closed a hundred years later in 1969. St. Jarlath lived in Tuam, Ireland, from 445 to 540. Chicago, Near West Side, 1879. Upon the death of his wife Mary Hartigan, James was left a widower with two children. James M. was 8 years old, and John T. was 11. James and Mary Hartigan had been married 11 years. 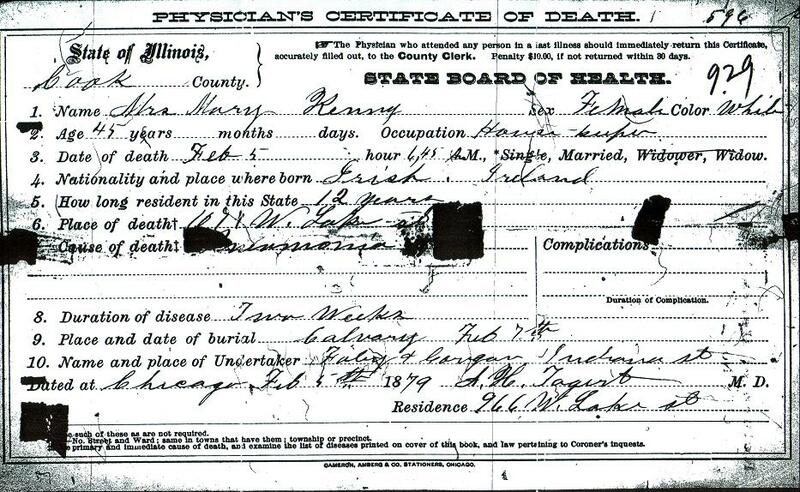 On February 5, 1879, Mary Hartigan Kenny, 43, died at 1079 W. Lake Street of pneumonia. She was buried at Calvary Cemetery in Evanston, Illinois. KENNY--Feb. 5, at 7 o’clock. Mrs. MARY, wife of James Kenny. Funeral Friday, Feb. 7, from her late residence, 1079 Lake-st., to St. Jarlath’s Church, at 10 o’clock, thence by cars to Calvary. Ireland, 1852-1872. 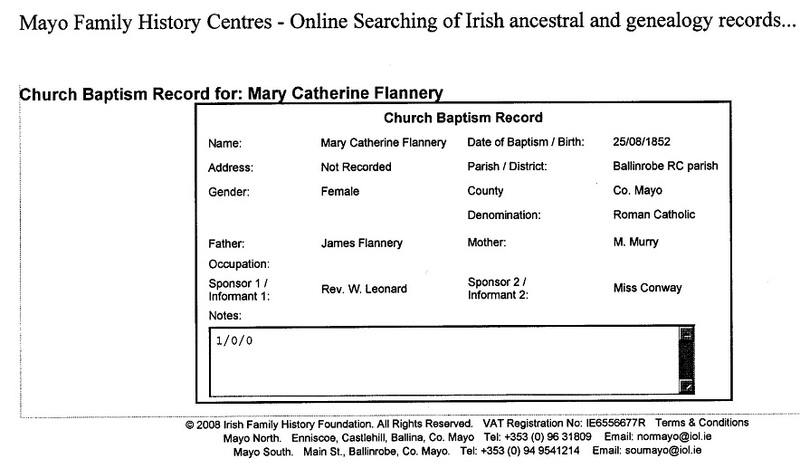 Mary Flannery was born in Ballinrobe, County Mayo, Ireland in 1852 She was baptized on August 25. Her parents were James and Mary Murray Flannery from Castlebar, County Mayo, who had just emigrated to Baltimore, Maryland. Mary Flannery stayed in Ireland, perhaps with her grandparents, rather than go with her parents to Baltimore. She stayed in Ireland until age 19. Chicago, Near North Side, 1872-1879. In 1872, Mary Flannery, 19, immigrated to Chicago, Illinois. In 1872, there were 37 states in the Union, the latest being Nebraska. Ulysses S. Grant was President of the United States. Chicago, Near West Side, 1879-1904. Ten months after Mary Hartigan died, James remarried. 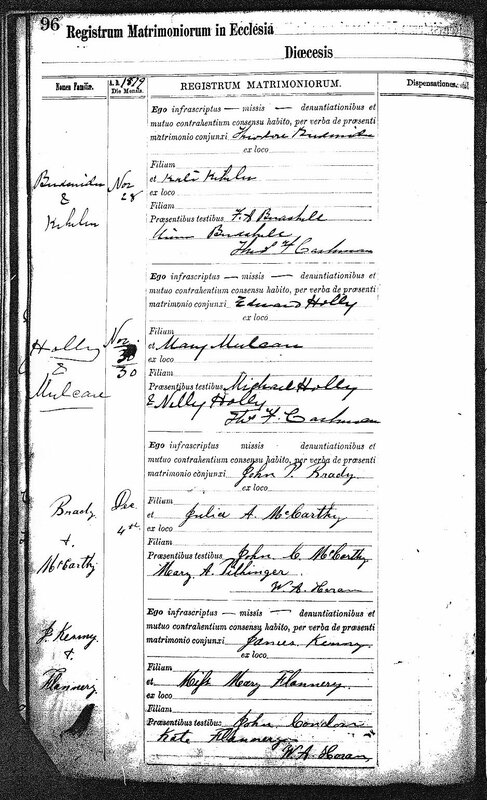 On December 9, 1879, James Kenny, 32, and Mary Flannery, 26, were married at St. Jarlath Church by Father W. A. Horan. Witnesses were John Condon and Mary's sister Kate Flannery. Kate was working as a servant on the Near West Side in the 1880 census. In 1879, James' younger sister Kate Kenny immigrated from Ireland to Chicago. In the 1880 census, James Kenny was listed as a shipping clerk. In the 1880 Chicago directory, he was listed as a clerk at 4 Market Street. He was not listed for 1881 to 1883. In the Chicago directories beginning in 1884, he was listed as an express man. In the 1880 Chicago directory, there was a second James Kenny listed living at 1079 W. Lake Street, a sail maker. This could not be their son James, who was only 9 years old. It could very well be James' father, but no other reference to him has been found yet. Sometime between 1880 and 1884, James and Mary Flannery moved around the corner to 54 N. Maplewood Avenue (253 N. Maplewood Avenue after 1909). In 1882, James' sister, Kate Kenny, married Peter Doody. Born in Limerick county, Ireland, Peter Doody came to Chicago in 1880. He would become Illinois state president of the Ancient Order of Hibernians. The 1902 Directory shows Peter and his brother John as officials of Division 1 of the AOH in Chicago. In the 1880 census, John T. Kenny was listed as a clerk at the Chicago Board of Trade. In 1890, James M., age 19, was listed in the Chicago directory as working as a clerk at 40 Board of Trade building. The Chicago Board of Trade was founded in 1848 and is the oldest futures and options exchange in the United States. 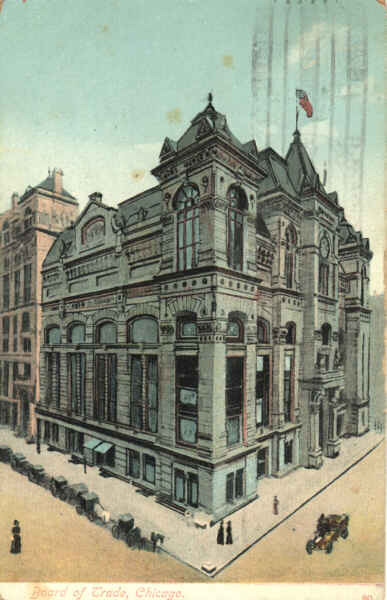 The building was built in 1885 at LaSalle Street and Jackson Boulevard and torn down in 1929, when the current building was completed on the same site. It was Chicago's tallest building at the time it was built. It was the city's first commercial structure with electrical lighting. In 1891, James M. became a clerk at the Post Office. In 1899, at age 28, he became a clerk in the Railway Mail Service, a position he would hold until his retirement in 1933. In 1900, Mary's father James Flannery died in Jordan, Green County, Wisconsin. James was age 78. On December 4, 1903, James and Mary were sponsors at the baptism at St. Malachy's Church of Helen McGuire, daughter of John McGuire and Winifred Murray, who lived at 53 N. Western Avenue (252 N. Western Avenue after 1909). Winifred Murray was a relative, possibly a niece, of Mary Flannery Kenny, whose mother Mary was a Murray. 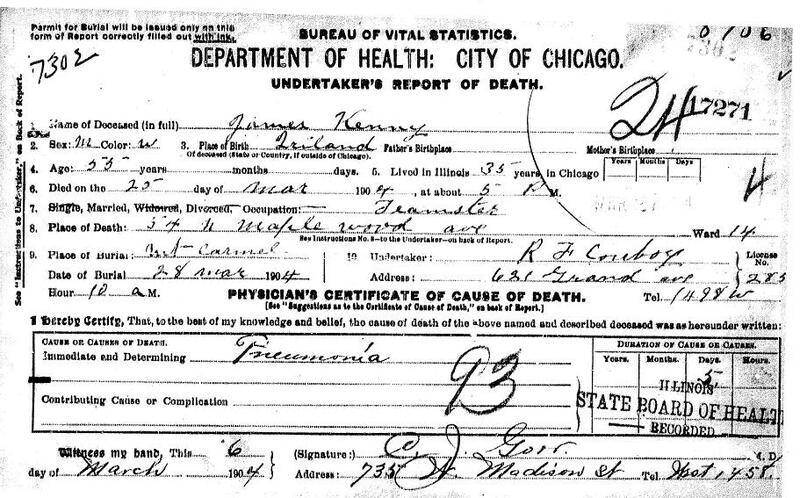 On March 25, 1904, James Kenny died at 54 N. Maplewood of pneumonia. He was age 55. He left his wife Mary Flannery Kenny and his two sons, John T. and James M. The two boys were still living at home. Following a funeral Mass at St. Malachy's Church, James was buried at Mount Carmel Cemetery. KENNY--JAMES, beloved husband of Mary Kenny (nee Flannery) and father of John and James Kenny, brother of Mrs. McNally, Mrs. Doody, March 25, 1904. Chicago, Near West Side, 1904-1923/28. Upon the death of James, Mary Flannery was left a widow at age 51. James and Mary Flannery had been married 25 years. Mary continued to live at 54 N. Maplewood (253 N. Maplewood Avenue after 1909) with her stepsons James and John. Sometime between 1904 and 1910, James' son John T. Kenny died. Mary is listed in the 1910 census as having two children, only one still living. In 1907, Mary's stepson, James M. Kenny, 36, married Charlotte Mae McDonald, 21, probably at St. Malachy's Church. James was 15 years older than Lottie. James and Lottie lived three blocks east of Mary at 1004 W. Lake Street (2350 W. Lake Street after 1909). 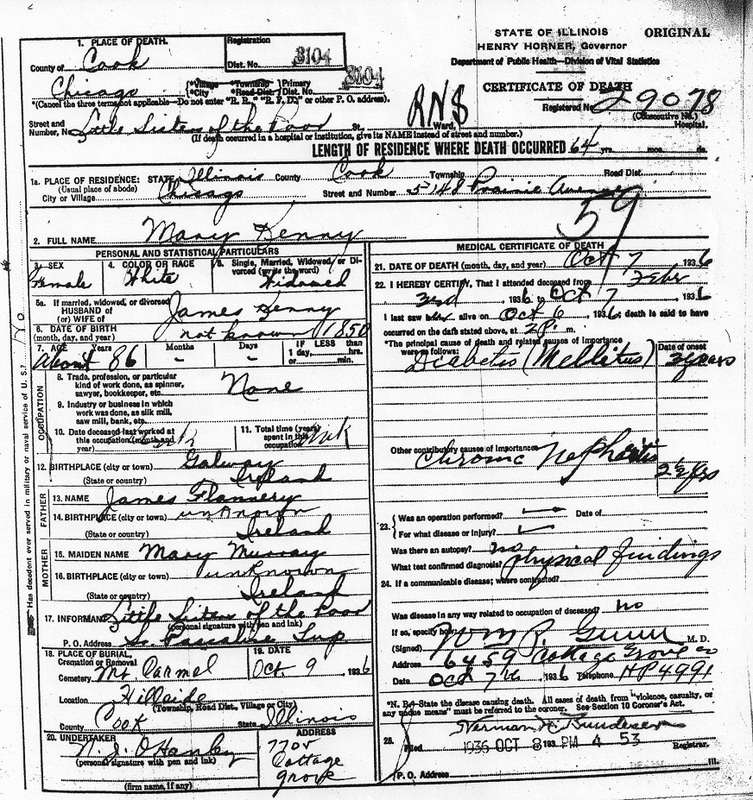 James and Lottie's only child, Henrietta Margaret Mary Kenny, who was called Bunny, was born on New Year's Eve, December 31, 1907. In 1908, James and Lottie moved three miles west, from St. Malachy's parish to St. Thomas Aquinas parish. They lived in the Austin section of Chicago at 1917 Park Avenue (4744 Park Avenue in 1909 and later renamed Maypole Avenue). Sometime between 1908 and 1920 James and Lottie moved three blocks further west to 220 N. Leclaire Avenue, still in St. Thomas Aquinas parish. In the 1910 and 1920 censuses, Mary was living alone at 253 N. Maplewood and renting part of the house to another family. In 1912, Mary's mother, Mary Murray Flannery, died in Wisconsin. She was age 82. In October 1918, a sister of Mary's husband James, Ellen Kenny McNally, 74, a widow, died at home in St. Columbkille's parish. She left one child, Mary K. McNally Mustard, who lived in St. Thomas Aquinas parish. James' other sister, Kate Kenny Doody, would not die until 1943. She was listed in the Chicago directory in 1923 at 253 N. Maplewood. There was no directory in 1924 to 1927. She did not appear in the 1928 and last Chicago directory. In 1934, Henrietta Margaret Mary Kenny married Edward William Carroll at St. Thomas Aquinas Church. Mary Flannery Kenny died in Chicago On October 7, 1936. She was 84 and had been widowed for 32 years. She was living at the Home for the Aged run by the Little Sisters of the Poor at 5148 S. Prairie Avenue at the time of her death. She was buried with her husband James Kenny at Mount Carmel Cemetery.